Let me give you a little background information. I was living in Greenville, SC at the time when I first got this news that I needed a liver transplant to survive. There are no transplant centers in Greenville, so it was looking like I was going to have move near a transplant hospital. I guess you could say, “luckily” for me, I was already packed, because I was in the midst of packing to move to Florida for a new career. What I did not know, was that my fate would point me back up to the Northeast, to Connecticut, where my life began, and might unfortunately end, if I didn’t get a transplant, soon. My liver was accidentally “nicked” during my liver biopsy which went undiscovered until I collapsed on the floor one night in an attempt to go to the restroom. I almost bled to death from substantial amounts of internal bleeding, followed by four episodes of cardiac arrest; things were not looking too good at all. Miraculously, my doctors were able to stabilize me without being invasive and officially get me on the transplant list. Within two days of officially getting on “The List”, I officially received the greatest miracle of all, a second chance at life! 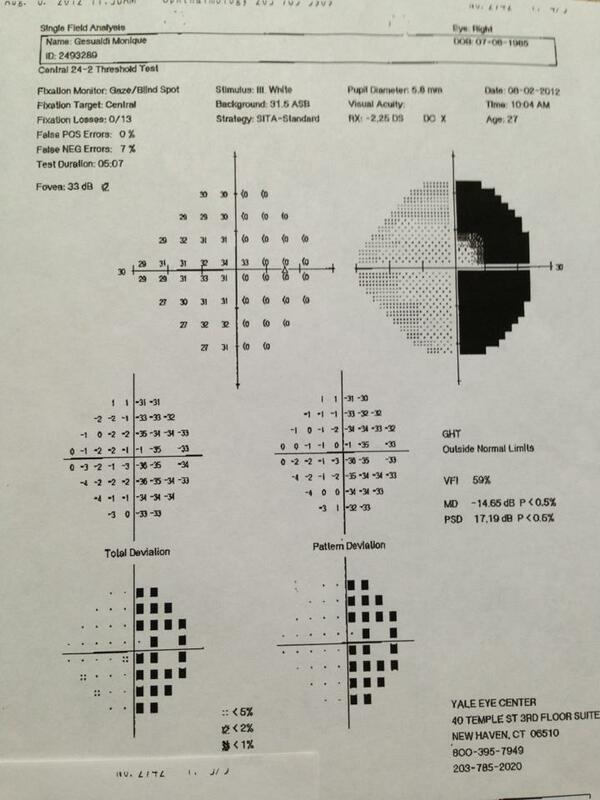 Shortly after my transplant, I exhibited some serious cognitive dysfunction. I was in-and-out of a “coma-like” state, and other times I was only able to say “yes ma’am” repeatedly over-and-over again. I began experiencing painful and distracting visual sensations, such as: colorful lights flashing, hearing voices, and a headache so bad, I would trade it for the worst migraine you think you’ve ever had, any day. I mentally checked-out for several days to one day awake to the comment, “You had brain surgery!” Excuse me? What did you say? “You had brain surgery!” I palmed the back of my head, and sure-enough, there was a line of staples going down the middle of my scalp. There was absolutely no other thought in my head at the time except, you’ve got to be effin’ kidding me? Not even three-weeks after barely squeaking away with my life with a last-minute liver transplant, and now they’re telling me I had brain surgery? What for? I wondered. Well those headaches, flashing lights, and voices were being caused by a rare fungal-infection that had manifested in my brain somehow since first being on immunosuppression in Greenville. It is unfathomable to express everything going on inside my head (literally and figuratively) at this time, but I couldn’t focus on any of that. My brain surgeon at Yale, Dr. Matouk, was unable to get all of the infection out in the first shot because there was great fear of leaving me completely blind, paralyzed, or possibly killing me due to its location in my brain. This monster of a fungal-infection had a name, and it was called aspergillus fumigatus; all I knew is that the aspergillus had to get-going, or it was going to be me that would be going….and never returning. The following week I was hooked-up to an IV of this antifungal medication called Amphotericin B for six or more hours per night. Amphotericin B is highly toxic and it’s side-effects are what I would imagine are somewhat similar to chemotherapy; god-awful. Ampho wreaks havoc both internally and externally to the point where my various medical teams had to come to a consensus as to whether my body could tolerate the medication any longer before it would cause my kidneys to fail; yet, I needed enough of the medication to zap the fungal infection in brain or that’s another (even worse) kind of trouble we’d be dealing with. A week following the Ampho treatment, my MRI showed no improvement in terminating the remainder of the infection, therefore, a second craniotomy was immediately scheduled. Brain surgery numero dos went down on June 11, 2012, but whether I would make it out of surgery alive and not paralyzed or completely blind, was something no one could answer. 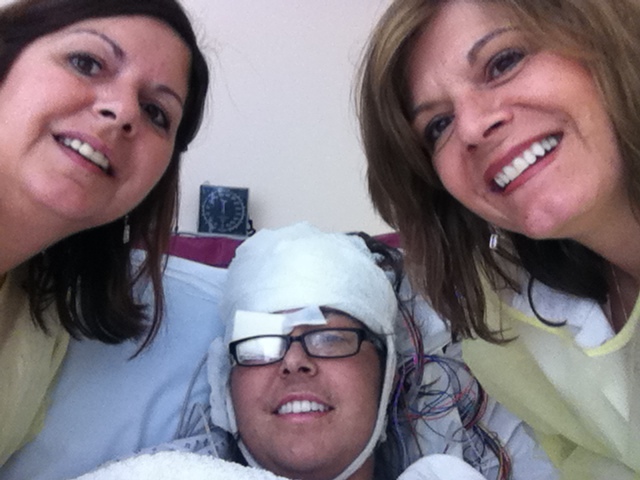 Top photos: Post-transplant, pre-brain surgeries, May 2012. 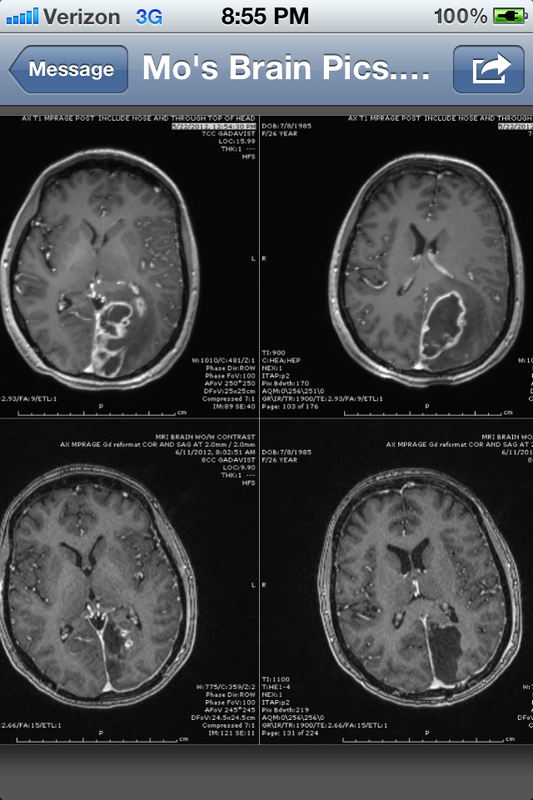 Bottom photos: Post-transplant, and two craniotomies (brain surgeries). 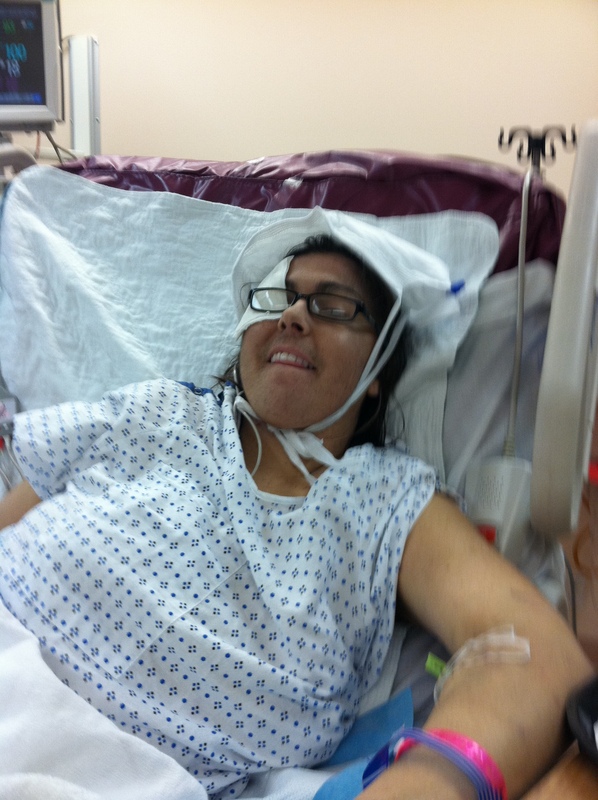 When I came back to consciousness the next day, there were doctors and family standing all-around me. “What is your name?” I was asked to write. My Aunt Caryn told me that my neurosurgeon thought there was an issue with me when I wrote down “Mo” because he only knew me by Monique. He asked me to read something from across the room and write it down, so I did, without any problems. My Aunt Caryn recalls him almost falling over in disbelief and excitement that I could read. Next, my sister asked me her name and I wrote down, “Punkass” a nickname I have loved calling her since she was a teenager, (that she doesn’t appreciate as much as I do J). Hey, well at least they knew they didn’t cut out my sense of humor during surgery! Flash forward to 20 months later, which happened to be yesterday, March 13, 2014. I am the polar-opposite of a “morning person,” but at 6:15 am yesterday I flew out of bed, hopped in the shower, and excitedly got ready to head to Yale-New Haven for my three doctor’s appointments. You’re probably thinking, wait you got excited to go to a doctor’s appointment? Well when are taking this medication that consists of 12 pills/day, costs $4400/month, and makes you really sensitive to the sun and light, you would thrilled to go to your doctor if you thought he was taking you off of that medication today, wouldn’t you? Following my Transplant Dermatology appointment and MRI of my brain. I met with Dr. Topal, my Infectious Disease doctor. Dr. Topal, reviewed by MRI of my brain with me, and just as I had anticipated, I can come off of the Voriconazole (anti-fungal for my brain infection). As long as the Aspergillus doesn’t come back, I will not have to take it, but the next three months they are going to watch me very carefully hoping it doesn’t come back. The thing about fungus is it usually grows very slowly, but because I’m on medication to weaken my immune system (so I don’t reject my transplanted liver), I can get ill and catch diseases that “normal” people’s immune systems can usually fend-off quite easily. The Voriconazole increased the potency of my anti-rejection drugs, so now that I am getting off the Vori, my doctors will be increasing my anti-rejection meds, which means my immune system will be weaker, and the risk of the aspergillus (if it is microscopically still present in my body at all) can try to attack my brain again. 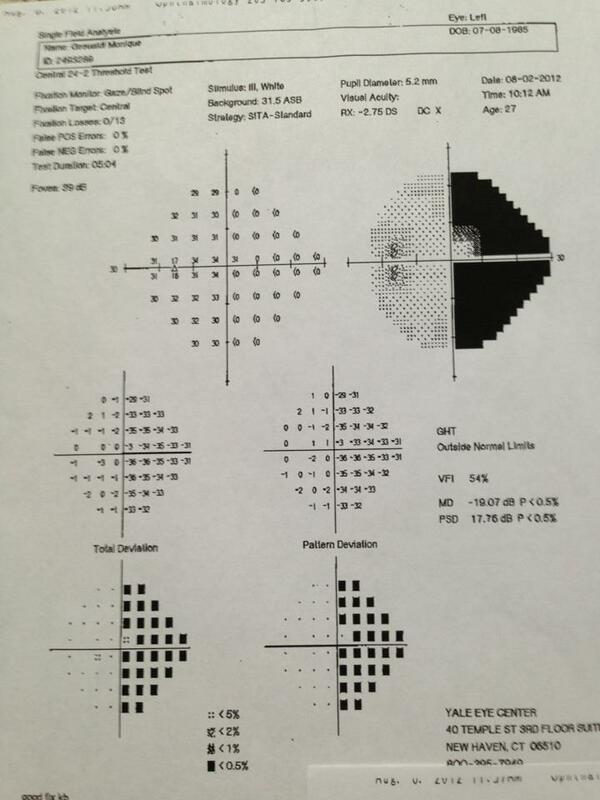 My brain scan, 3/13/14 at Yale-New Haven Hospital. While I anticipated being taken off the Voriconazole, what I did not expect was my MRI scan to look like this: HOLE-y MO-y! I showed my grandma and her reply was, “Now I know what is wrong with you.” She’s quite the comedian, haha. That sounds pretty serious, but I’m not scared at all. 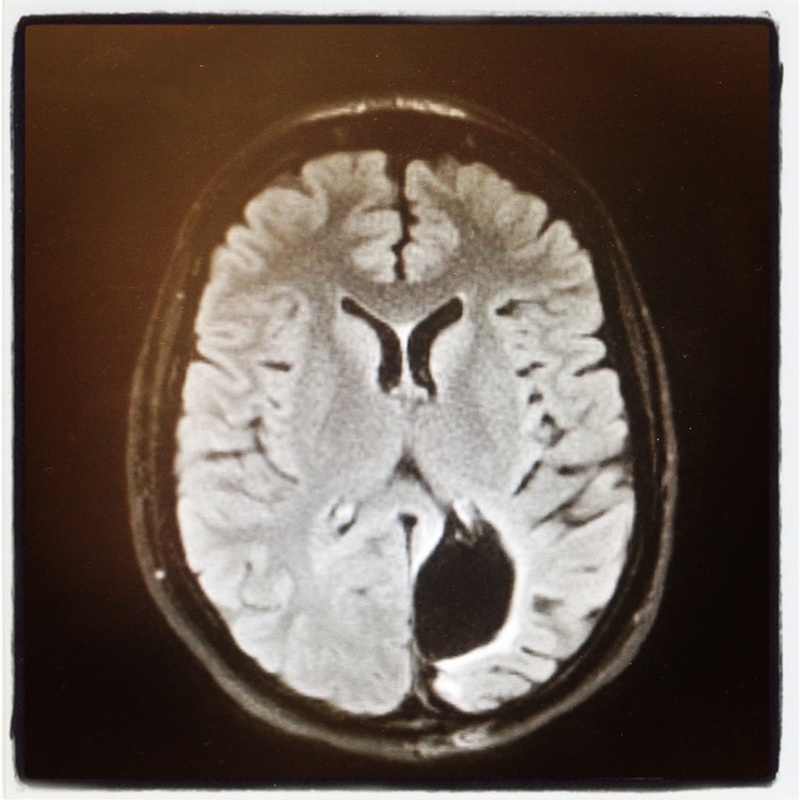 This June will be two-years since I survived my brain surgeries to remove the aspergillus. People have brain surgeries every day across the world, but for a transplant patient to have brain surgery, twice, to remove aspergillus fumigatus, which has almost a 100% mortality rate in transplant patients, is unbelievable. Not to mention, just three very short weeks after battling for my life and having a new organ transplanted into my body, there is no other word for it besides it is a miracle! I am so blessed to be a miracle, but it is not because of what I did, it is because I have the most incredible medical team constantly looking out for my well-being, the most wonderful friends and family constantly motivating me with their love and encouragement to do great things, and finally, because I have embraced a belief system that anything in the world is possible if you set your mind to it. My mind is set on achieving these great-big dreams of mine, like winning the Gold Medal in Golf at the Transplant Games of America and being on the Ellen DeGeneres Show to raise awareness about organ/tissue donation. I know I am a miracle, and I am beyond thankful to have been given this gift of life, and a chance to change my life for the better and inspire others along the way. One thing I want you know is that you don’t have to have a liver transplant or have a huge hole in your head to do great things in your life. For me, it took me as sick I became to finally listen to that voice inside my head telling me take care of myself, and not just my body, but my mind, and my soul as well. If I didn’t get sick, I probably would have never changed my ways. The matter of the fact is, getting sick and being on my death-bed was the eye-opener I needed to make the changes I needed to make in myself so that I could be the best person that I can possibly be and reach my highest potential in life.